Famous for Black Paintings of Mammoths on Grand Ceiling. on the Grand Ceiling, Rouffignac. Black painting of Woolly Rhino. 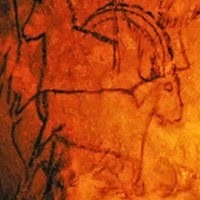 Yet another important centre of prehistoric art in the Dordogne, Rouffignac Cave is famous for four things. (1) Its size: with more than 8 kilometres of underground passages, it is the largest site of Franco-Cantabrian cave art, and still relatively unexplored. (2) Its unique collection of cave painting and rock engravings featuring almost 160 mammoths, including the famous "Patriarch" mammoth. They account for about a third of all mammoth-images in European cave art - hence Rouffignac's nickname "Cave of the Hundred Mammoths". (3) Its extraordinary ceiling ("Le Grand Plafond de Rouffignac") decorated with a swirling ensemble of 60 large black drawings of horses, mammoths, ibex and bison. (4) A unique black drawing of a bearded human face ("tete barbue de face"). The earliest art is indirectly dated to about 14,000 BCE, with the rest being assigned to the middle phase of Magdalenian art, about 14,000-11,000 BCE. 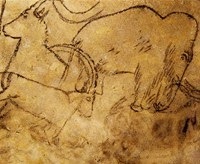 For more about the chronology of cave painting in the Dordogne, please see: Prehistoric Art Timeline (from 2.5 million BCE). Rouffignac Cave, also known as Miremont cave, Cro de Granville or Cro des Cluzeau, is located on a hill slope alongside the La Binche river, in the French commune of Rouffignac-Saint-Cernin, in the department of the Dordogne. Resembling a massive tunnel, its limestone walls are rich in flint nodules but there are no stalactites or stalagmites. Its natural floor consists of a sticky, unpleasant clay. An electric train is used to convey visitors around the cave. There are numerous other sites of Paleolithic art in the area, including: Abri du Poisson (c.23,000 BCE); Abri de la Madeleine (20,000); Lascaux Cave (17,000); Font de Gaume Cave (14,000); Cap Blanc Shelter (c.13,000) and Les Combarelles Cave (c.12,000 BCE). A tourist attraction since the 19th century, Rouffignac Cave was visited by French prehistorians Edouard-Alfred Martel (1859-1938), Henri Breuil (1877-1961) and Andre Glory (1906-66), as well as Denis Peyrony (1869-1954) the renowned expert in parietal art of the Perigord. But it wasn't until 1956, when the prehistorians Louis-Rene Nougier and Romain Robert reinvestigated Rouffignac, and discovered the bulk of its rock art, that the cave became established as a major centre of Magdalenian culture. In 1957, along with several other caves and rock shelters located in the Vezere valley, Rouffignac cave was listed as a French historical monument, and in 1979 was designated a world heritage site by UNESCO. see: Oldest Stone Age Art: Top 100 Works. Loosely speaking, there are four types of art at Rouffignac: animal paintings and engravings; pictures of anthropomorphic figures; abstract signs; and finger flutings. The animal imagery is centered on the mammoth, but includes representations of other creatures, as follows: 160 mammoths (70 percent of all known images at Rouffignac), 28 bison, 15 horses, 12 ibex, 10 woolly rhinoceroses, 6 snakes, 2 cats, 1 cave bear and 1 deer. The anthropomorphs include 1 vivid black sketch of a bearded face, and a pair of figures known as "Adam and Eve". Abstract signs appear in the form of tectiforms, serpentiform, groups of lines and bars, dots and other indistinct markings. Many of these symbols are placed next to certain animal figures, or groups of figures. Lastly, there is roughly 500 square metres of finger flutings (macaroni or meander-like traces) at Rouffignac Cave, most in excellent condition. They appear to be the work of at least seven individuals, including children as young as 3-years old. The decorations appear throughout the cave, but are concentrated on the top floor (Sacred Way, Breuil Gallery, the Grand Ceiling). Like the Chauvet Cave paintings, but unlike most other Magdalenian sanctuaries like Lascaux or Font-de-Gaume Cave, the paintings are monochrome in colour, appearing mostly as black contour drawings (manganese) or more rarely, red clay or white chalk. Although archeological excavations at the entrance to the cave have yielded traces of human habitation during the later eras of Mesolithic art (from 10,000 to 4,000 BCE) and Neolithic art (4,000 to 1,800 BCE), very few artifacts from the Upper Paleolithic (before 10,000 BCE) have so far been found inside the cave, and no direct dating has yet taken place. Thus the art has been indirectly dated by its stylistic content, according to guidelines laid down by the renowned French archeologist Andre Leroi-Gourhan (1911-86). On this basis the art has been attributed to Leroi-Gourhan's style IV, roughly 14,000-10,000 BCE. Although a sizeable area of the lower, more remote levels of the cave remain uninvestigated, the richest area of Stone Age art so far discovered is undoubtedly the Grand Ceiling of Rouffignac ("Le Grand Plafond"). This is located about 700 metres from the entrance of the cave in the main gallery known as the Sacred Way. The ceiling is remarkable for two reasons. First, its concentrated mass of 65 animal figures - the largest and best images in the cave - most of which are drawn in black and include: 26 mammoths, 12 bison, 11 horses, 12 ibex, 3 rhinos, and one mountain goat. Second, the fact that it appears to have been a highly dangerous place to create a gallery of pictures. When researchers first entered the cave, the ceiling was a mere 1 metre above a huge 7-metre deep hole in the cave floor, which occupied the entire width of the gallery. This dangerous pit had slippery clay sides and led only to a river below. Why did Rouffignac's Stone Age artists paint so many beautiful animal figures in such a dangerous and obscure place, when there was so much flat ceiling space in the gallery before and after the hole. The pit was definitely in existence when the ceiling was painted, since (like in the Apse at Lascaux) there are traces of a wooden platform used to support the artists above the pit during their work. Since its initial discovery, the pit under the Grand Ceiling has been filled in, and the floor lowered to allow easy movement and better viewing conditions. Aurignacian shelter containing the oldest engravings in France. Mutilated handprints and other abstract symbols. Noted for its exceptional large-scale engravings. Has Placard-type abstract signs and wounded human figures. Type-site for the aviform symbols at Pech Merle and Cougnac. The benchmark for Solutrean rock carving and relief sculpture. Noted for bison relief sculptures and abstract signs (claviforms). Best known for its engraved drawing of the "Sorcerer". Noted for its Magdalenian frieze of relief sculpture and engravings.  For more about Franco-Cantabrian cave painting, see: Homepage.